This healthy sweet potato breakfast bowl is simple to make, perfect for those following Whole30 or are paleo, and is sure to hold you over since it’s packed with protein! Breakfast is the meal I have the hardest time with. I never know what to make and it’s challenging coming up with new ideas that meet my dietary restrictions. I try to avoid sugary cereals, limit my grains and I’m one of those with celiac disease that can’t tolerate oats… so needless to say my options are limited! A few months ago I did Whole30 and was researching breakfast ideas, and sweet potato bowls kept popping up, so I thought I’d give it a try! What’s so great about sweet potato bowls is that you can modify them by adding in your favorite things! Since getting diagnosed with celiac and often struggling to keep my vitamin levels up, I always say when it comes to food I try to get the “most bang for my buck”. What I mean by this is, I try to make sure each meal is filled with nutrients and try to avoid empty calories. 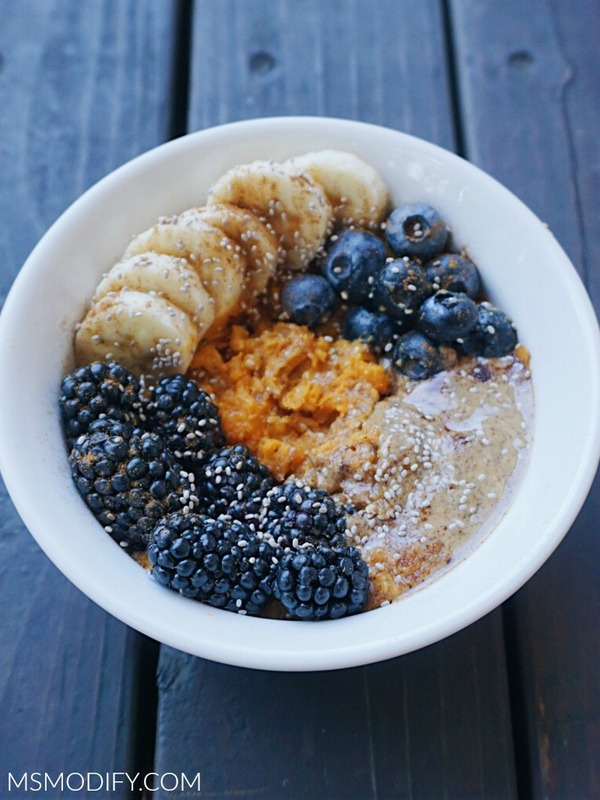 This sweet potato breakfast bowl definitely is packed with lots of nutrients! You can either bake a bunch of sweet potatoes ahead of time and store them in the fridge or cook them each day you make this. Eat this hot or cold… it’s delicious both ways! Scoop sweet potato out of skin and mash in a bowl. Sprinkle some cinnamon in and stir until evenly mixed with the mashed sweet potato. Layer banana slices, berries, scoop desired amount of almond butter, top with more cinnamon and sprinkle in chia seeds. *You can substitute with any type of berries or your other favorite fruit! This entry was posted in Recipes/Dining Out and tagged breakfast, paleo, sweet potato, Whole30. Trust me, at first I didn’t think so either, but now I’m obsessed with it! 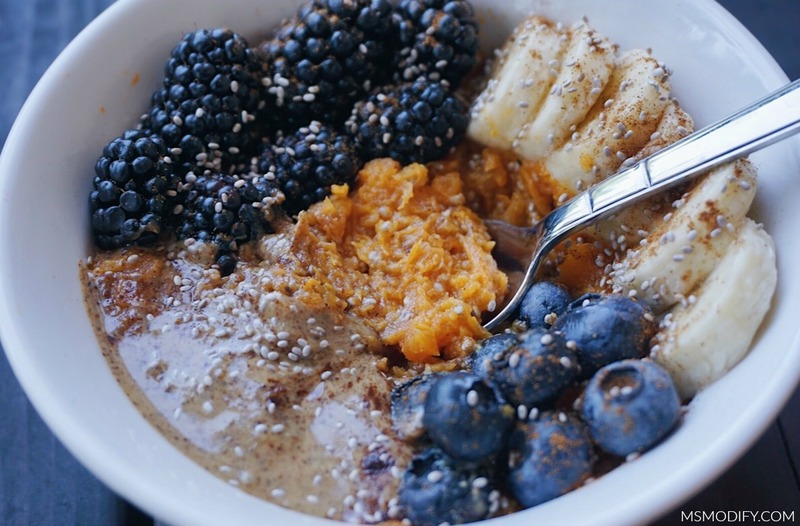 Oh my goodness why have I never thought of adding sweet potato to my breakfast/smoothie bowls?? I love sweet potatoes and nut butter so this looks perfect!! It’s my new favorite breakfast!